"The Having of Wonderful Ideas" and other essays on teaching and learning. (2006) Teachers College Press. Science Education: A Mind's-On Approach for the Elementary Years. Editor Jack A. Easly (1990) Taylor & Francis, Inc. Teacher to Teacher: Learning from Each Other. 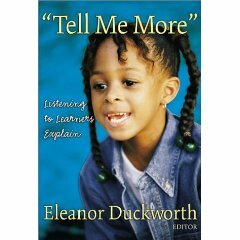 Eleanor Duckworth, Experienced Teachers Group (1997) Teachers College Press.